Three summers and one spring! The beach-front resort on the Costa del Sol is blessed with an average of 320 days a year of sunshine and breathtaking views of the Mediterranean Sea, Gibraltar and African coastline. Embedded in 45,000 sq m (484,376 sq ft) of tropical gardens, Kempinski Hotel Bahia features three outdoor pools (one heated), a beach-volleyball area, a tennis court, waters sports (seasonal), a fun Kid’s Club and a relaxing Kempinski Spa. The 128 spacious rooms impress with a contemporary design and stunning views. The 17 suites are modern and unique – whilst the Imperial Suite comes with over 650 sq m (6,997 sq ft) of perfection. All rooms and suites feature their own balcony or terrace. The Hotel’s four restaurants and three bars offer something for everyone’s taste including fresh seafood at the beach restaurant La Cabaña del Mar; romantic Italian cuisine at La Trattoria; the Alminar Wine and Steak House and the Kempinski breakfast buffet at El Mirador Restaurante. The Lobby Lounge specialises in Merienda – an Andalusian style high tea; while The Bar counts over 100 different single malt whiskies. For a nice cold drink by the pool, guests can visit the Pool Bar. Its privileged geographic location on the shores of Andalusia makes the Hotel perfect for cultural trips. Most monumental cities such as Granada, Sevilla, Cordoba, Malaga, Ronda or Jerez can be visited with half-day excursions. Trips to Tangier in Morocco are also possible. 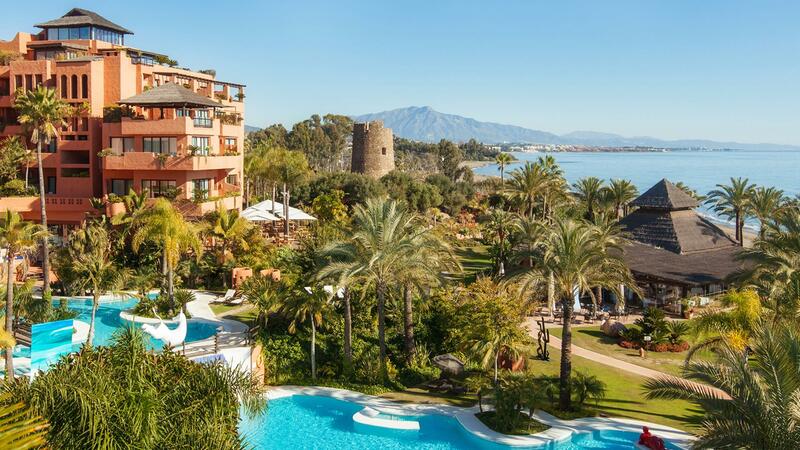 With over 50 golf courses in the area, this little paradise between Marbella and Estepona is ideally located for golf lovers. The Hotel very own Golf Desk can help facilitate golf booking and lets guests benefit from special agreements with over 20 of the area’s golf courses. The combination of attention to detail, excellent service, one large ballroom, six meeting rooms and 15 smaller breakout rooms also makes Kempinski Hotel Bahia a perfect venue for your next business meeting, incentive or private function. Dream beach weddings or celebrations can be organised directly on the beach or at the beach restaurant La Cabaña del Mar.